Yesterday the National Trust posted the video on their Facebook page, and then people started tweeting… By the end of the evening, I was forwarded an email that had been passed around from NPS staff, with this message, among others: “NPS loves it”. The comments on the NTHP Facebook post were also all enthusiastic. Many commended the video for being so informative. Quite a few alums of the program also showed some #UMW #HISP pride. For those in the UMW-know, there is a special guest appearance by legendary Historic Preservation professor Gary Stanton. He is definitely O.G. UMW Historic Pres. He’s a veritable fount of awesome, and few students who have had him will disagree. Earlier today he sent me an email noting how quickly the video got taken up on social media, pointing to an email chain of replies that made its rounds throughout the federal offices of note. He made the simple and powerful point that it would have been next to impossible for him to get the same message across to the administrative brass at the National Parks Service through traditional means. And he’s exactly right, and that’s seems to be at least part of what these four students are rapping about. 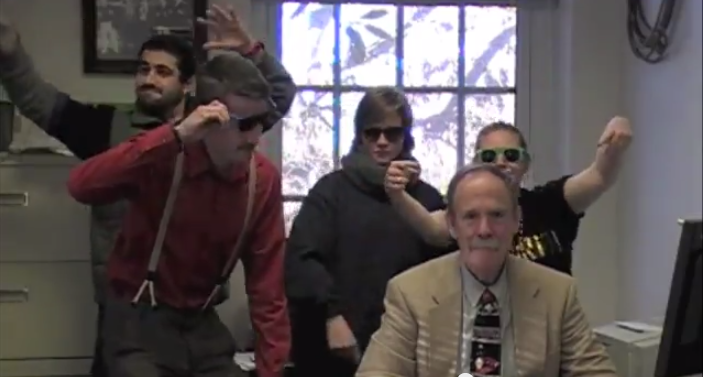 UMW nerd rap #4life. On a more personal note, Gary will be retiring after next year. This is a sad reality I am gearing up for. I will sorely miss his presence at UMW when he does retire because he’s one-of-kind: his course sites are akin to national archives when it comes to resoures, his work with Fredericksburg’s local archival resources has been shamefully overlooked by the unviersity for years, his stories about all things American Folklore are amazing, and his dedication to the craft of teaching may be unparalled. So losing someone like Gary is huge. But I think Gary would be the first to agree that much of the Jedi force he has brought to the department can also be found in Andi. She represents a very bright future for the department’s long tradition of excellence. I can’t help put compare the deep similarities of both Gary’s and Andi’s passion for what they do everyday. In fact, I’ve seen very few academic departments in my long life in higher education that are as congenial, dedicated, and alive with the force of awesome as UMW’s Historic Preservation—and I haven’t even mentioned Doug Sanford yet! So bravo to the students for making this video. Bravo to the Historic Preservation department that continues to cultivate a culture of excellence and fun simultaneosuly. And bravo to Andi Livi Smith who is jist on a sick professional tear that is so fun to be witnessing. This entry was posted in umw, video. Bookmark the permalink.